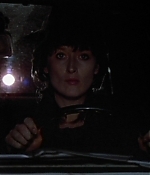 With only three films left to cover, today I spotlight my third favorite performance – as Karen Silkwood in Mike Nichols’ “Silkwood”. New DVD screencaptures have been added to the image library and all production, promotional and photoshoot pictures have been re-added in better quality. Three new clips can be found in the video archive. Also, make sure to read the site’s special on the real Karen Silkwood. Production notes and review after the cut. As always, please share your thoughts on “Silkwood” in the comments. Mike Nichols’ drama “Silkwood” is based on the real life case of a plutonium processing plant metallurgy worker who discovered corporate powers were covering up radiation leaks at Oklahoma’s Kerr-McGee plant. Karen’s whistle blower efforts as a union activist to reveal Kerr- McGee’s possible radiation poisoning of its employees ended tragically. Karen had been a union activist with the Oil, Chemical, and Atomic Workers’ Union who was a vocal advocate for plant safety. Reportedly on her way to meet with New York Times reporter David Burnham, Karen died in a suspicious one-car accident in November 1974. Some believed the accident was actually an intentional murder for Karen’s outspoken critique of Kerr-McGee plant safety. Others blamed Karen’s abuse of alcohol and drugs, found in small quantities in her blood. Nichols’ film is an attempt not to sugarcoat or make Karen Silkwood into a martyr, but to show the reality of her life as a powerless but very human and determined working class woman. As Streep observed in a 1983 American Film interview, “she wasn’t Joan of Arc at all. She was unsavory in some ways and yet she did some very good things.” In Nichols’ interpretation of Karen’s life, Karen lives in an unconventional fashion with her boyfriend Drew (Kurt Russell) and lesbian friend Dolly (Cher) in the desolate expanse of rural Cimarron, Oklahoma. In addition to her effort to expose negligence at the nuclear plant, Karen is also engaged in a protracted battle with her former common law husband for time with their three children. With a growing sense of determination and purpose, Silkwood shows Karen’s metamorphosis from an irresponsible, directionless woman into someone awakened to the world around her and anxious to fight for a cause. Silkwood was in the end a triumph of powerful performances from Streep, Cher and Russell and a realistic take on the American working class. “Mike spoke of the film as being about people being asleep in their lives and waking up: ‘How did I get here?’ And that’s exactly how I felt,” Streep told American Film. “I think the movie is about human nature more than about any issue,” said Streep. 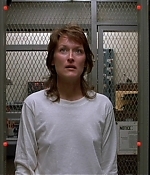 In answer to an American Film question about whether making Silkwood allowed Streep to know Karen Silkwood, the actress responded, “I get very creepy feelings if I think about it. My heart breaks for her. She was only twenty-eight or twenty-nine when she died, and it was a real waste. I’m really glad I got the chance to try to step into her shoes for a while.” Following her death, an autopsy revealed that Karen Silkwood had plutonium contamination in several organs. Her family filed a civil suit against Kerr-McGee following Karen’s death for inadequate health and safety at the plant which led to her plutonium exposure. After years of legal fights, the suit was finally settled out of court for $1.3 million. Jane Fonda, who starred in another nuclear power plant thriller The China Syndrome (1979) for a time owned the rights to the Silkwood story. Fonda’s costar in 9 to 5, Lily Tomlin also auditioned for the role of Dolly. But the roles proved to be tailor made for both Cher and for Streep. Meryl only had 2 1/2 weeks off between shooting Sophie’s Choice and Silkwood. That incredibly demanding schedule might be attributed to Streep’s acknowledged reluctance to turn down jobs for fear that the offers would stop coming. Again, she was received as Best Actress at the Academy Awards. Cher also received great acclaim and a Best Supporting Actress Oscar nomination for her role. Silkwood was nominated for a total of 5 Oscars including for Best Director, Screenplay and Film Editing. In “Silkwood”, Meryl once again proves that there are no limitations in vanishing into character, even if it’s “only” a modern-day working girl. After playing a British outcast and a Polish conentration camp survivor, she owns the screen as a chain-smoking, short skirted Oklahoma pothead. Since the real Karen Silkwood is not anchored in the public mind in terms of her look or private behavior, it gives the film freedom in sticking to the facts, while making Karen a believable yet sometime fictional character. We get to know Karen’s flaws quite early. While she has her heart on the right side, she’s cheeky, flirty although in a relationship and smokes pretty much everything and all the time (it’s stunning how much cigarettes are smoked in this film). Everybody knows somebody who behaves like Karen does. And it takes some time until she realises the full measurement of what happens. That’s Mike Nichols’ successful task at telling Sikwood’s story the way stories unfold in real life – slowly. This means that the first half of the film, which focuses on Karen’s private life, her failed marriage as well as her relationship with Drew and Dolly is rather slow as well and it takes some patience to sit through the first hour. But once Karen starts working with the union, the film gains strength and becomes a thriller without the usual elements of an ordinary whistleblower film. Besides Streep, Kurt Russell and especially Cher are giving fantastic performances. For Cher, it must have been even harder to be believable for an audience as an ordinary person – and a lesbian. But she’s magnificent in her supporting part that won her not only acclaim, but the business’ respect as an actress. 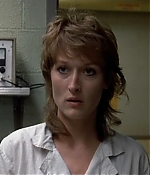 “Silkwood” might demand your patience, but it rewards you with one of Meryl’s best performances of the 1980s.